“Complex but Lighthearted” That headline is not one most associate with an Amouage attar – but Amouage Al Mas Attar breaks the normal ‘amouage attar’ mold, with its lighthearted notes of clary sage and lily of the valley, underpinned by orange blossom. I am always surprised by how ‘ladylike’ this attar is. Perfect for a warm spring day. (that was the mini-review of Amouage Al Mas (the Diamond) I wrote for Patty and Lisa’s new perfume samples and perfume decants store Surrender to Chance. If any of you are interested in reviewing some of your faves/not-so-fave scents, they have a review option for each scent offered) It’s a great way to share your thoughts about a particular fragrance with those who might want to know more about it. Like a lot of people, I had a very specific ‘vision’ of what an attar is – it’s heavy. It’s dark. It’s jam-packed with oud/oudh. It’s mysterious. It’s heavy. Basically, all the definitions I found reference attar as a basic essential oil of a distilled flower or herb, the most well-known being ‘attar of roses’. How attar came to be thought of as heavy and oudish (at least amongst my crowd) is understandable – most of us only know a few attars and those, while gorgeous in the extreme, do tend to land heavily on the side of the Heavy Duty Rose, with a side of Smoky Incense. My first introduction to Amouage attars came in the form of Amouage Tribute. I was immediately smitten but it’s one of those attars I can only wear …..where? There are so few comfortable places. I mean, it’s so gorgeous!!! But it’s so smoky, so complex, so…..foreign…that it …well, after a few nervous glances towards nearby fire extinguishers I now tend to wear it At Home. Lounging around in a silk caftan, on a silk divan, fanning myself (with a silk fan, scented with Amouage Tribute Attar). Or tucked up in bed, apres-bain, with the Really Good Sheets. Or at the opera. Seriously. It’s perfect for the opera. Or a gallery opening, where you want to make a Statement. One drop of Amouage Tribute will scent your 3/4 length leather gloves for a month! It lasts for a day and shimmers and glows through all its smoky-deep facets to an incredible drydown but, make no mistake – it’s deep. Amouage Al Mas is totally the opposite: I wear Amouage Al Mas all over the place! Elegant, beautiful – but easy to wear. The geranium stands in for the rose, and fixes the muguet in place, with sparkling results. Geranium is one of my favorite notes – when I have raised beds I always plant scented scented geraniums along the edges, since nowadays ladies rarely wear long gowns that would brush the leaves as they walk down garden paths, the raised bed method means they will get some ‘brushing’ when the beds are tended. I’ve yet to sniff a geranium that didn’t have a minty undernote and I suspect that is where a lot of the sparkle is coming from in Amouage Al Mas. The notes (courtesy Surrender to Chance) are counterintuitive to what I deemed ‘attar’ : orange blossom, lemon and rosemary; middle notes of lily of the valley, geranium and clary sage; and base notes of sandalwood, oak moss and musk. I never expected to fall in love with a sparkling diamond of an attar like Al Mas. I mean, c’mon – lemon? Lily of the valley? Who knew? It is a gorgeous, romantic, peppery/lemony floral that shimmers and shifts from the lightness of the LotV, to the warmer, heavier sandalwood, then back again. And: It’s got the staying power of a rhino. You put this one on at 7a, it will still be with you at 7p. It’s an oil, btw (I’m not persackly sure about this but something tells me that all attars (or most?) are oils – or more oil than alcohol, at any rate – the way it works best for me is I apply it right after my shower. It seems to adhere to my damp skin and even travels a bit (since it’s an oil you can’t spray with abandon). It’s the perfect attar for a cool Spring day – I can’t wait to see how it comports itself in 90F+ It’s just so danged pretty!!! Alas, Amouage Al Mas is not available in the US, alas – there are a lot of Amouages and other attars that are not available in the US. Alas. I’m trying to set my company up to quote on some work in the Sultanate (actually it would be Qatar, which is about 500miles away and let me tell you, it is NOT “just like going to Wisconsin” but I am willing to do it) – with any luck we’ll get a job and have to go over there to meet with them. Yes, I am Just That Crazy. I would jump through hoops of business fire for a chance to travel to the Middle East . El O just laughs. He figures I won’t like the idea of hijab in 100-degree heat. But oh, for a chance to just roll around in a full bottle of Al Mas and the rest of those attars! Can you imagine me in an Omani perfume boutique? I’d be like Patty’s cat, Rex! Or that even scarier Rex, T! You can try Al Mas via Surrender to Chance. Yes. It’s Shameless Cross-Promotion but I’m Honey Badger Musette and I Don’t Care. I’m not getting compensated by StC, Patty, or Perfume Posse. It’s just….well, if you want to try it you have to know where to get it, right? There ya go. 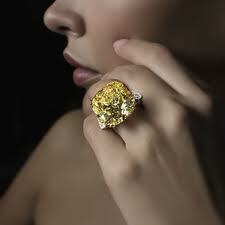 Photo: Fancy cut vivid yellowGraff diamond – Al Mas smells just like this looks, only not quite as……heavy. if I weren’t going to have them roll me up in a carpet and toss me on the curb when I die, I think I might not mind being embalmed in this stuff! I thought – damn, Musette, way to go there! Okay, now I need to get Lisa to send me some of that al Mas. I’m with you, I wanna go roll around in those oils firsthand. so if you go, you have to take meeeeeee!!! Hon, I’m with you all the way on the vision-thingy 😀 Facebook is the worst, perhaps because of all the thumbnails. I misread the weirdest things…. btw – I am not sure Muscat is ready for Thelma and Louise is hajib! I can see it now: T Perfumista Rex saunters into the flagship Amouage boutique in Oman (boom…boom…boom…raawrrrrr!). Having a long tail would really enhance sampling sprees, wouldn’t it! See, this is why I Like You!!! I seriously plan to learn PhotoShop when I retire – I think it would be so fun to play with images. And you deserve fun, too, Patty! You have convinced me to try this despite the muguet. It’s usually a deal killer, like tuberose, but I’m going to throw caution to the wind. I don’t think you’ll regret it – it’s not ‘muguet-y, like Diorissimo or Muguet des Bois – the muguet is part of the ‘sparkle’ – but I would be hard-pressed to winkle it out of the overall composition. It’s pretty seamless. Actually I love vtg Diorissimo but the muget in that doesn’t come off as cloying, (On my skin) like most muget scents do. Hells Bells! I went to Surrender To Chance with the intention of ordering Al Mas…but then I got sidetracked by vtg Doblis and Fol Arome. But I swear, I have it on my list and will give it a go. I think there should be a try this option here at the Posse where you can just order a sample of the scent in question without well, surrendering to chance that you’ll get totally distracted by all the other smellies. lmk about the vint Doblis!!! Dooooobliiiiis! Oh, Nooooooo! You’ve induced another lemming, and for something so nearly unobtainable. Hope StC has a nice big stock of this, you have me reaching for my credit card 😀 I love the way attars seem to wear very close to the body, but last and last. It’s one of the things I treasure in the Homage Attar, which is my precious. Be well. Hey, darlin’!!! I still owe you a review of Homage, which I will do next – I promise!!!! This is one of those attars that you could easily wear to work – it won’t irritate or offend anybody but it won’t bore you, either! Musette, it was so sweet of you to use a pic of my engagement ring! I’m glad you are okay with that – I know I should’ve asked beforehand. Looks good on you!!! Hey, doll! This sounds right up my alley — finally! An attar that I can wear and one that I can wear to work. I’m wondering now if Surrender to Chance has had a run on this and is getting close to being sold out (hope not!). Dang it. Every time I read a Musette post I spend money. I had trouble logging in today, sorry — also, young lady, I am taking those emoticons away from you! Also, I really like attars on men…. on me, not so much. But you make this sound very tempting. Dang, just noticed the banner head, it looks great. I want that diamond ring… I loves me some canary and champagne diamonds. I want some Al Mas, too; despite the muguet, it sounds wonderful and I have secret hopes that’ll be spectacular on me.